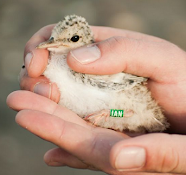 Kilcoole Little Tern Conservation Project: The Chicks Have Arrived! The caravans are still in place, the colony is still active, and Ken still hasn't been blown away- though the strong SW winds that have been swirling around the site do mean our resident scarecrow has been sleeping on the job. Some exciting events have been happening over the past week, the most major news being that chicks have started hatching!! Little Tern chicks. Picture taken under NPWS licence (I. Sullivan). Their parents have been busy bringing prey species (such as sandeels) back to growing chicks and ensuring their broods stay nice and cosy. Both parents share these duties, and swap roles through out the day. Currently in the colony there are 35 chicks. The satellite colony supports 13 active nests, with the central colony supporting 153 nests. A highly significant component of the work carried out here at Kilcoole is the ringing of chicks and recording of their biometric data. Measurements such as wing length and weight, taken regularly, provide the wardens with accurate indicators of chick growth rate and general success. Chick growth rates also reflect hunting success and food availability for parent birds. Metal ringing is carried out on newly hatched chicks, while colour rings are fitted when the chicks have grown in order to ensure the weight and size of the ring has no detrimental effect, and stays in place while the chick moves about. The colony's newly hatched chicks are keeping a pretty low profile at the moment, huddling into the scrapes for warmth and to escape the attention of "predators," (usually a day warden, tip-toeing through the shingle). They are impossibly cute and fluffy and we're looking forward to seeing them grow successfully into fledglings. The wardens here at Kilcoole continue to strive for Tern safety - carefully moving nests in danger of flooding, and doing their very best to keep an eye out for potential predators. We will continue to provide updates on how the chicks are doing, so stay tuned!